VeraCrypt is absent in the standard Tails repositories. But you can still install it manually. VeraCrypt has a portable version, so you can save it to the Persistent folder and it will be available to you after each Tails reboot. By the way, in Tails there is a program for “unlocking VeraCrypt disks and containers”, but this program is not able to create containers and, frankly, I do not know should it be trusted. For this reason, we will install the full, original VeraCrypt from the author. 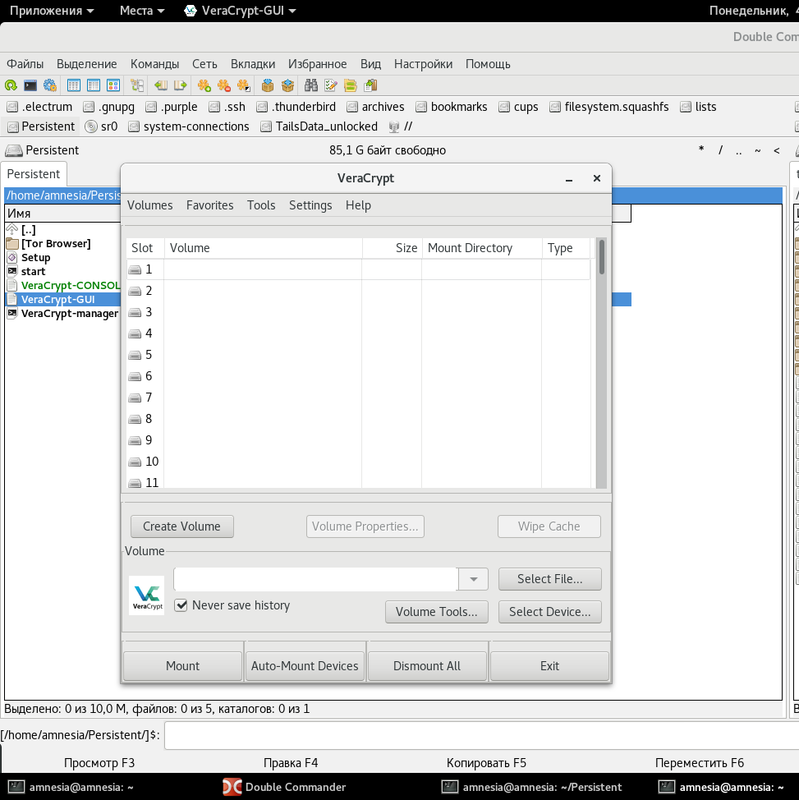 So, I will show how to install the portable version of VeraCrypt in Tails in the Persistent folder. Therefore, you must have persistent storage enabled. You can run VeraCrypt from it, as well as create VeraCrypt containers on the same persistent storage. Consequently, both the program and the encrypted containers with your files will be saved and will not disappear after reboots. You can install VeraCrypt manually, links to official sites and instructions are given in this article. 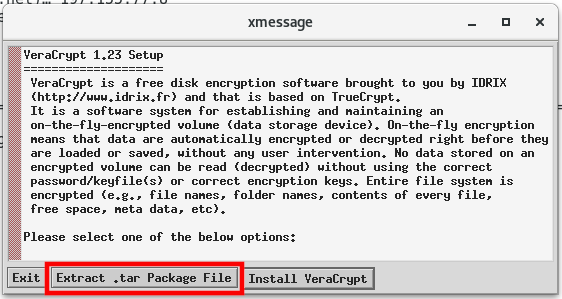 But installing VeraCrypt even in regular Linux can cause confusion among users, so a script was written (it is in the same article) that helps to download and install the latest version. 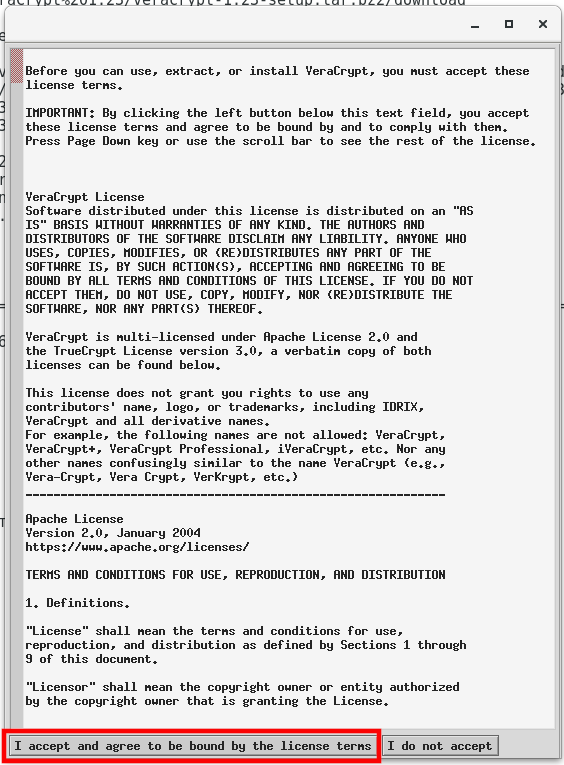 this is done for VeraCrypt with a graphical and console interface. echo "Trying to download the installation files"
temp="$(curl -s https://sourceforge.net/projects/veracrypt/files/ --proxy socks://localhost:9050/)"
echo "Could not connect to remote server"
temp2="$(curl -s https://sourceforge.net/projects/veracrypt/files/VeraCrypt%20$v/ --proxy socks://localhost:9050/)"
wget "$LINK" -O "veracrypt-setup.tar.bz2" --proxy "socks://localhost:9050/"
Immediately you will be thrown to the installation of the console version. Then press Enter to exit.